Today, all players that own Battlefield 1 can jump into Rupture for free, which is a map featured in Battlefield 1: They Shall Not Pass, set during the Second Battle of the Marne and characterized by its poppies growing over rusty wrecks. In addition, the next few months will bring even more free content to all Battlefield 1 players including Soissons in May, also from Battlefield 1: They Shall Not Pass, to tackle one of the biggest tank assaults of World War I. In June, bit-sized epicness is coming to Battlefield 1 in a new mode, Shock Operations. The mode supports 40 players and sees attackers and defenders battling over sectors like in fan-favorite Operations mode, but with the action focused to one single map – ideal for those that don’t have time for a full Operations match. Shock Operations will be available on five maps: Giant’s Shadow, Prise de Tahure, Lupkow Pass, Zeebrugge, and River Somme. Most of these maps are normally only available to owners of Battlefield 1 Premium Pass or standalone expansion packs. However, base game owners will be able to access them too when playing Shock Operations. Check out the Battlefield 1 blog to stay up to date on what’s to come to Battlefield 1 in the coming months. Over the past six months, we’ve steadily ramped up our anti-cheat efforts, working closely with the FairFight team to detect and remove more cheaters than ever before. In October alone, we sanctioned over 8,500 accounts. Since then, instances of cheating have declined. While we have made significant gains, we still can do more. Battlefield 1 veterans may remember the global messaging that was sent every time FairFight had acted against a player. As we ramped up our efforts against cheaters, these messages became a distraction from other in-game discussions, and they were disabled a few months ago based on your feedback. However, our communication about this created some questions. Going forward, our communication will be more clear, transparent, and proactive. Soon, you’ll see a new form of FairFight messaging. This will condense the combined bans from the last 24 hours into a single in-game post, sent every few hours. We saw a rise in the number of social media posts claiming FairFight had banned players incorrectly after the October ban wave mentioned above. However, we are confident that our detection methods produce accurate results. Cheat developers may be attempting to manipulate players’ minds about anti-cheat tools, and to leverage detection information from game developers. A common misconception regarding FairFight is that higher skilled players are more likely to get sanctioned due to their improved match stats. This is not correct; it is not possible to be banned simply for being skilled. The second wave of Battlefield 1: Turning Tides is here! Fight alongside the formidable German fleet or test your mettle among the British Royal Marines in dramatic naval clashes. Opposing armadas struggle to gain the upper hand to exhibit supremacy over the high seas. Battlefield 1: Turning Tides – North Sea is bringing new maps, the fearsome C-Class Airship, and continued improvements to Battlefield 1. We hope you enjoy taking command of the sea, air, and land in the battles that turned the tides of war. Available to Battlefield 1 Premium Pass owners* and owners of Battlefield 1: Turning Tides. View the official Battlefield 1: Turning Tides – North Sea release trailer HERE. *Battlefield 1 Premium Pass and Battlefield 1 Revolution owners will be able to access Battlefield 1: Turning Tides with a two-week early access. The Battlefield 1: Turning Tides update is a required download for all Battlefield 1 players to play online. This has several benefits, including that players who don’t yet own the expansion will be able to watch Battlefield 1: Turning Tides matches through Spectator Mode and will be able to experience the new maps via Battlefield 1 Premium Trials or Battlefield 1 Premium Friends when they are active. A great year for Battlefield 1 has begun. On the road ahead players will find great content, trials, more Battlefield 1: Turning Tides, and of course, Battlefield 1: Apocalypse. Between January 16th and January 22nd, all Battlefield 1 players can storm the Gallipoli peninsula thanks to the Battlefield 1: Turning Tides – Gallipoli Trial. This trial will also give base game owners a chance to conquer the fronts of Battlefield 1: In the Name of the Tsar and Battlefield 1: They Shall Not Pass. Additionally, Battlefield 1 Premium Pass owners can dig in to the North Sea campaign of Battlefield 1: Turning Tides. With the Zeebrugge and Heligoland Bight maps, the British Empire Royal Marines, and the new C-Class Airship, the amphibious warfare possibilities will be greater than ever. Previously available only to Battlefield 1 Premium Pass owners, night map Prise de Tahure becomes available for base game owners starting January 16th. Stay tuned for more news on Battlefield 1: Apocalypse and for full details on the road ahead you can check out the blog here. Soon, you’ll experience battles on land, in the air, and at sea on the newest front for Battlefield™ 1™ as Battlefield 1: Turning Tides comes ashore. Read on and learn what awaits as you continue to conquer the entire Great War. Battlefield 1: Turning Tides will be released in two waves – the first coming on December 11 for Battlefield 1 Premium Pass owners. This content drop will let you fight across a duo of epic maps: Cape Helles and Achi Baba. In a new Operation set on these maps, you can take part in the 1915 British amphibious assault of the Gallipoli peninsula. 6 weapons and 2 melee weapons will be added to your arsenal, and you’ll get to rule the waves with the L-Class Destroyer. There’s more coming after your December battles – you’ll be tackling the North Sea in January. As mentioned, Battlefield 1 Premium Pass owners get a two-week head start with Battlefield 1: Turning Tides. Once their head start with the North Sea content has ended, Battlefield 1: Turning Tides will be available to purchase as a standalone expansion pack. Conquer land, air and sea in the amphibious battles of the Great War! 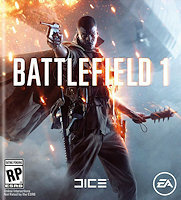 In Battlefield 1: Turning Tides, players can deploy into all-out war in a variety of maps and gameplay set across Gallipoli and the North Sea. The third expansion of Battlefield 1 will bring 4 all new maps, 6 new weapons, an Infiltrator Elite Class, L-Class Destroyer, C-Class Airship, a new epic Operation and more. In the new game mode, Conquest Assault, a twist on the signature conquest mode, attackers and defenders fight over key areas, exclusively controlled by the defending team as the match starts. To learn about each of the maps, weapons and more of what players can immerse themselves in with Battlefield 1: Turning Tides, coming this December, head to the Battlefield 1 website. Starting today, Battlefield 1 Premium Pass owners can start their two-week early access of Battlefield 1 In the Name of the Tsar. On September 19, the most extensive Battlefield expansion yet – and winner of the “Best Add-On/DLC” Gamescom Award – will be available for purchase for all players. New to Battlefield 1? Play the In the Name of the Tsar content today and get early access to all other unreleased expansions with Battlefield 1 Revolution*. We hope you will enjoy all that Battlefield 1 In the Name of the Tsar has to offer. It’s not only French and Russian soldiers who were left out of World War 1 in Battlefield 1 [official site] for later appearances in paid expansions: women are coming in DLC too. Soldiers from the 1st Russian Women’s Battalion of Death will serve as the multiplayer Scout class for the Russian forces coming later this year in the expansion In the Name of the Tsar, DICE have revealed. They look pret-ty gnarly all right but it’s such a shame they’re limited to paid DLC. DICE don’t have much more to say for now, instead pointing people towards EA’s big E3 livestream presentation EA Play on June 10th. Okey cokey. Supposedly DICE did originally plan to include women soldiers in Battlefield 1 then changed their minds. Bedouin rebel Zara Ghufran is playable in part of the game’s singleplayer campaign but the plan was to have female soldiers in multiplayer too. We’re glad to announce that a new map called “Prise de Tahure” will be released shortly for testing on the CTE (Community Test Environment). Set in the autumn after the Nivelle Offensive, Prise de Tahure sees French troops desperately holding on to re-captured heights in the Butte-de-Tahure region. The frontline trench networks cut right through several villages facing obliteration from the constant skirmishing between German stormtroopers and French raiders. This is a war of attrition. Adaptability and tactics are the means to wear your adversary down. Stay tuned for more details and join the CTE to try the content early and give your feedback.